The first two winters we were here it was very difficult to get grinding, Green’s mill, at Dayton, being the only one within fifty or one hundred miles, and this mill occasionally froze up in the winter; the mill would be so crowded sometimes in the winter, that parties going to mill would have to wait sometimes two and three days for their grist. I have laid by the hopper some two nights in succession, in the coldest of weather, waiting for my turn. 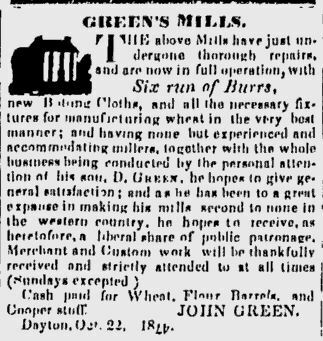 If you left your post, some one might slip a grist in ahead of yours; but this was soon remedied by the erection of mills on the Big Vermillion, and Dr. Woodworth’s, at Marseilles.